Wal-Mart Pulls Out Of Group That Advocates 'Stand Your Ground' Laws : The Two-Way The giant retailer has joined the list of major corporations withdrawing their support from the conservative political organization, which advocates a type of law that came under intense focus after the Trayvon Martin killing became a national story. Wal-Mart has joined the list of major corporations withdrawing their support from a conservative political group that advocates the "Stand Your Ground" laws that came under intense focus after the Trayvon Martin killing became a national story. "The American Legislative Exchange Council, or ALEC," as The Associated Press writes, "is made up of a group of lawmakers and private sector officials and has become a lightning rod for political debate in recent months. Wal-Mart has been a member since 1993." Selina Gray of Sanford, Fla., at a protest there on March 31. Last month, NPR's Peter Overby reported, "a coalition of liberal and civil rights groups went public with a campaign to undermine" ALEC. In the first week or so of that effort, "seven corporations — Coca-Cola, Pepsi, Mars, Kraft Foods, McDonalds, Wendy's and the software maker Intuit — dropped their memberships in ALEC. The Bill and Melinda Gates Foundation said it won't give ALEC any more grants, though one already under way [would] continue." Late Wednesday, the AP reports, Maggie Sans, Wal-Mart's vice president of public affairs and government relations, sent a letter to ALEC. The giant retailer, she said, is concerned that ALEC has been getting involved in issues that "stray from its core mission 'to advance the Jeffersonian principles of free markets.' "
"To that end, we are suspending our membership in ALEC," she wrote. ALEC issued a statement saying it is "disappointed," but understands "the unique pressures they [Wal-Mart] are under," the AP says. Stand Your Ground laws, as we've written, basically get rid of the English Law concept of a "duty to retreat" from a situation that is dangerous outside your home. Martin, 17, was shot and killed in Sanford, Fla., on Feb. 26 by George Zimmerman, a neighborhood watch volunteer. Zimmerman, who has since been charged with second-degree murder, has claimed he acted in self defense. 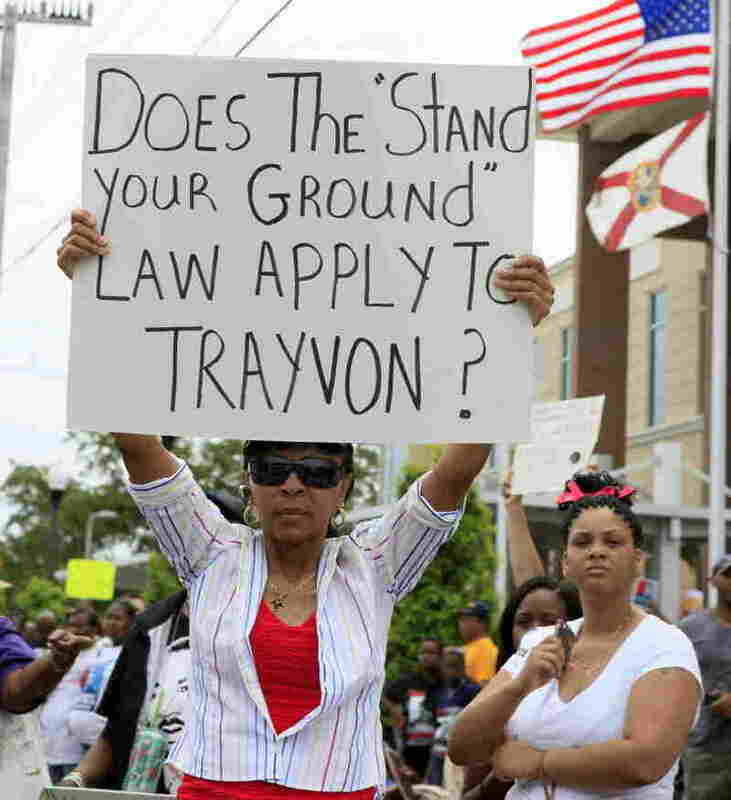 Florida is among 17 states that have enacted Stand Your Ground statutes since 2005. Martin's family and supporters allege Zimmerman racially profiled the African-American teenager, and followed him despite a police dispatcher's advice not to do that — negating an Stand Your Ground defense. Zimmerman had called police to report a "suspicious" man in his neighborhood.